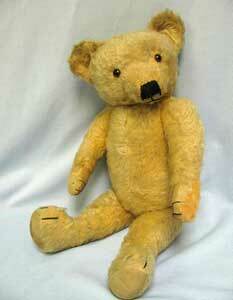 Merrythought bears came relatively late to the early bear scene in the UK, with the company being established in 1930. The traditional bear from this company came in ten different sizes in gold mohair and various coloured art silks. Merrythought teddy bears are still hand finished to this day and have always been considered very high quality British bears. After the Second World War the company began to produce most of their bears for the export market, America in particular. From 1982 limited edition bears which were signed by the chairman of the company were exported to America to cater for their ever increasing teddy bears collectors market. However there are some vintage bears made by this company which had a few different features such as the 1930's "Bingie Bear", who was not fully jointed, did not have the webbed claws and had a single front head seam. Large ears set on the side of the head. 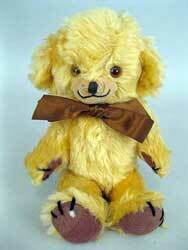 Early Merrythought antique teddy bears had a celluloid button in the ear and a paper tag around the neck. Some also have a embroidered label on the foot.